Like many Canadian farming families, the Horvaths’ story in Alberta begins many decades ago. At the age of 16, Steve Horvath and his father came to Canada from Hungary, with little money and big dreams. Working their way across the prairies, the Horvath men arrived in Alberta and began clearing and working the land, establishing a farm near Alsike, about 60 miles southwest of Edmonton. Within years, more of the Horvath family immigrated to Canada and began to expand, both in numbers of people and size of the farmland. Today, the Horvath farms continue to operate and flourish in the same locations their relatives originally settled. Ed and Sherry Horvath are now the owners of Sunshine Organic Farm, a well-known staple found year-round at the Downtown Edmonton Farmers’ Market. I caught up with Sherry to learn more about the people behind the market stand, the history of the farm, and the benefits and challenges of being a year-round market vendor. Image courtesy of Sunshine Organic Farm. I discovered that while Sunshine Organic Farm has been certified organic for 16 years with the Global Organic Alliance, the land has been farmed naturally and without the use of chemicals for decades. At the farm, you’ll find Ed working organic fields of wheat, oat, barley and hay to be used as feed for livestock. While that may sound like enough work as it is, the Horvaths also cut, grind, smoke, make and package sausages out of the cattle, pigs, turkeys and chickens they raise themselves. When asked about the challenges of farming in the winter, Sherry explained that while marching through the snow with egg pails can be exhausting, and taking off your gloves to untie hay bales for feed can be uncomfortable, it’s just a part of a life on the farm. In fact, the more challenging part of their work is keeping up with the demand of market goers, especially given the Horvaths’ involvement at every stage of the production lifecycle. When asked what items are their biggest sellers, Sherry said chicken breasts, eggs, ground beef and ground pork disappear especially fast (good tip if you’re not normally a morning market-goer!) However, Sherry also pointed out that given the market’s broad spectrum of shoppers, from young families to new Canadians, every cut of meat tends to disappear. She has also found that as local restaurants experiment more with what used to be mistaken for lower quality cuts of meat, people are starting to become more familiar with them and have more ideas on how to take advantage of pieces which may be less expensive. During our conversation, Sherry clarified that one of the harder parts about being a market vendor in the winter has less to do with the livestock they raise, and more to do with the consumers they’re raising them for. As people slow down and stay inside on cold winter days, vendors suffer from quiet markets. Plus, the move indoors means the downtown market is less likely to catch the attention of passersby in the winter. Despite the calmer days, Sherry says she still feels very fortunate to have a place inside of Edmonton’s beautiful City Hall, and says she is thankful for their regular shoppers, friends and fellow vendors downtown. 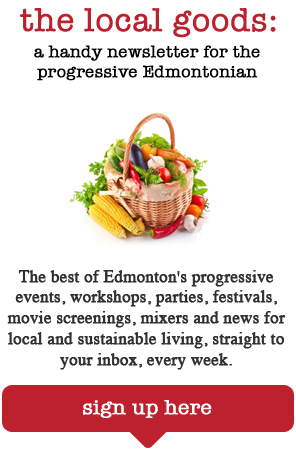 This weekend, why not treat yourself to a morning at one of the many winter farmers’ markets in Edmonton? Pick up some eggs and bacon from Sherry at Sunshine Organic Farm for your Sunday brunch! While you’re at it, grab some fresh, local produce for feel-good, flavourful dinners for the week to come. Stay tuned for a follow-up post this summer when Elyse visits Sunshine Organic Farm to give you a behind-the-scenes look at the life of a local producer!